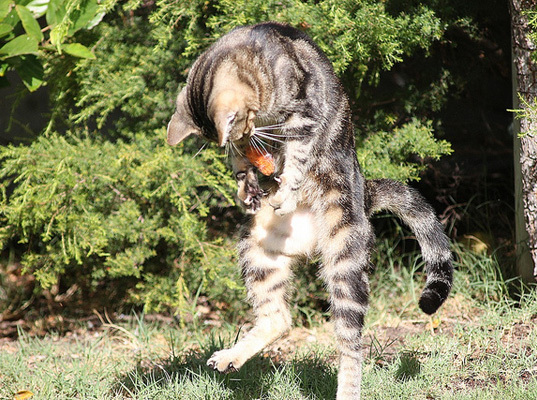 Most of us are familiar with the savage instincts of our feline friends; some kittens playfully pounce upon balls of wool or fuzzy, rattling toy mice, while human companions of outdoor cats may have been the lucky recipient of a gifted dead bird. But a report from the Smithsonian Conservation Biology Institute and the Fish and Wildlife Service has found that those gifts are just the tip of a very large, very murderous iceberg — one which holds the four-legged friends to account for the deaths of over 14 billion animals every year, a staggering amount of carnage that is two-to-four times higher than previously thought. The study examined the lives of both feral and household pet cats and found that collectively, cats are responsible for the death of 2.4 billion birds and 12.3 billion mammals each year. That makes the innocent-looking domestic cat the single largest human-linked threat to wildlife in America. Unfortunately, the report also found that the animals killed are far more likely to be of the native variety, like voles, birds and chipmunks, than the pest variety like the Norway rat. In fact, the cat is such an efficient killer that more birds and mammals die at the paws of a cat than from cars, poison and collisions with buildings or windmills. While everyone can agree that it is safer for a cat to be kept indoors, both for wildlife and for the cat, the majority of the killing is performed by feral cats, rather than household variety. Stray and feral cats account for 61 percent of the birds and 89 percent of the mammals killed each year. Finding a humane solution to the homeless cat problem has been a challenge for local animal-control organizations: trap-and-neuter programs have their drawbacks and the number of unwanted cats that are euthanized each year is staggering. The one thing that is certain is that while the cat population continues to grow, the wildlife population will have yet another man-made threat to contend with. Are you kiddin' me?! We can live without MEAT! But nooo we are eating more and more! I'm not a vegetarian but your opinion/study is absurd. How many mammals do we consume in a year?! How much nature part do we destroy in a year! Cat damages is far away from ours. Be honest yourselves. Our are inside. The one cat we did allow outside did bring us a number of geckos, which is why she's an inside cat, now. They don't have to run uncontrolled. Good comments from others. Cats are an easy blame. Yes they do kill - no argument. But this is just one issue. 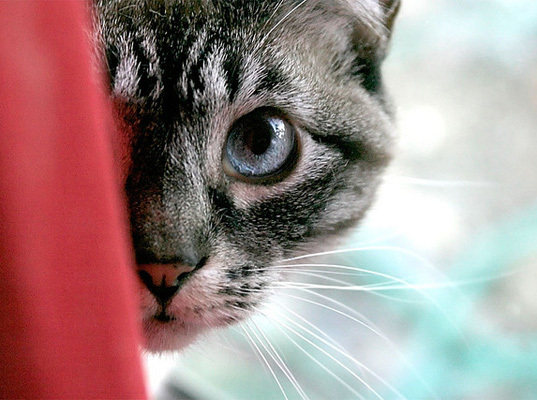 More and more cat owners are becoming more careful with letting their cats out and about. We need more education and yes more care with our environment starting with each one of us planting more native shrubs and trees and taking care of were and how we live. Just wonder, how many billions of animals do humans kill every year? And, how many species of animals have humans killed off the planet, never to be seen on again on earth? Just wondering. People, please keep your pets on a leash or in the backyard or house. Don\'t let them wander around, they will kill or be killed. Okay, I get it, cats kill birds. But it is our fault birds get killed by cats even if we dont own a cat. By planting lawn instead of trees and shrubs that birds can be safe in, we have created an extremely unsafe environment for birds. Get rid of your lawn! Plant trees and shrubs! Most of us are familiar with the savage instincts of our feline friends; some kittens playfully pounce upon balls of wool or fuzzy, rattling toy mice, while human companions of outdoor cats may have been the lucky recipient of a gifted dead bird. But a report from the Smithsonian Conservation Biology Institute and the Fish and Wildlife Service has found that those gifts are just the tip of a very large, very murderous iceberg -- one which holds the four-legged friends to account for the deaths of over 14 billion animals every year, a staggering amount of carnage that is two-to-four times higher than previously thought.